A Belated Welcome Back to Dad | What Smells So Good? 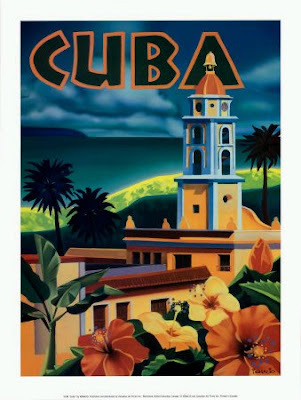 Monday morning, my wonderful, hard-working and fun-loving Dad got back from a well-deserved trip to Cuba! His girlfriend Martha won the trip though a charity raffle, and just 3 weeks later they jetted off on an all-inclusive resort vacation. The lucky bums got to tour the locale (where neither of them had been before), and even took a side trip to Havana! I can't wait to see the pictures, plus a little birdy told me there were some shiny things in store! I knew he would get my sister and I souveniers, but it isn't something I expected him to do, since before he left he gave me two Cuisine de France Santoku knives! In honour of his return I've found a few Cuban recipes for inspiration, including today's from Taste of Cuba. One of the main components of Cuban cooking is sofrito. Sofrito is a Spanish word for a well cooked and fragrant sauce. In Caribbean and Latin American cuisine, it is a sauce of tomatoes, roasted peppers, garlic, onions and herbs. Chop all the ingredients (except bay leaf, sherry and olive oil) in a blender. Sautee chopped mixture with bay leaf in oil until all vegetables are limp. Add sherry and let simmer 15 minutes.